It was with much trepidation that I set off for Celtic Manor last Thursday. 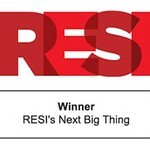 estatecreate was one of four companies invited to pitch at RESI’s Next Big Thing. As with all these type of things, the nerves were worse than the reality and it was a lot of fun. The audience voted by text and the Dragons made the final decision – estatecreate is now officially RESI’s Next Big Thing.